Today, customers are at the heart of digitization. Smart companies are using artificial intelligence to better understand their customers, build engagement and offer a hyper-personalized experience. The smart speaker market is forecast to grow at a CAGR of 48% between 2016 and 2020. And our research of over 10,000 consumers shows that more than two-thirds of consumers (69%) consumers are satisfied with their AI-enabled interactions. As Figure 1 shows, the top three attributes they prize are: first, greater control; second, 24/7 availability; and third, faster resolution. Take a strategic, AI-first approach. While consumers acknowledge the benefits offered by AI, they also make it clear that they want and expect AI to have human-like attributes. More than three out of five consumers prefer a solution to offer a human-like voice and intellect. And, as Figure 2 shows, they are willing to reward those that deliver. 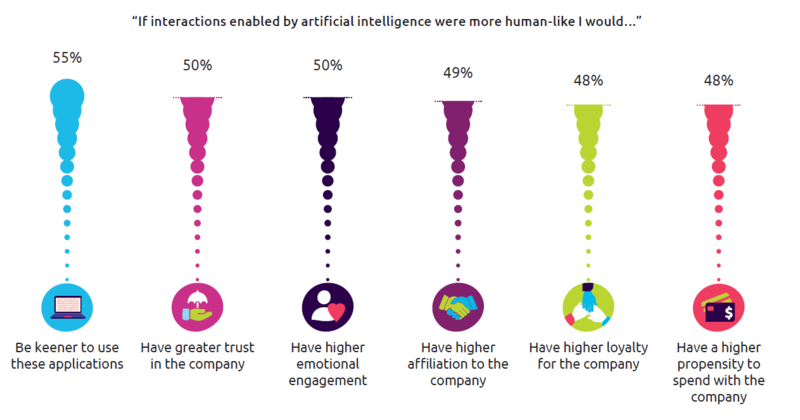 For example, close to half (48%) will be more loyal and likely to spend more with the company if AI-enabled interactions are more human-like. While the consumer opportunity is clear, many organizations are looking at the AI-driven customer experience as yet another IT initiative, with a strong focus on ROI and cost of implementation. 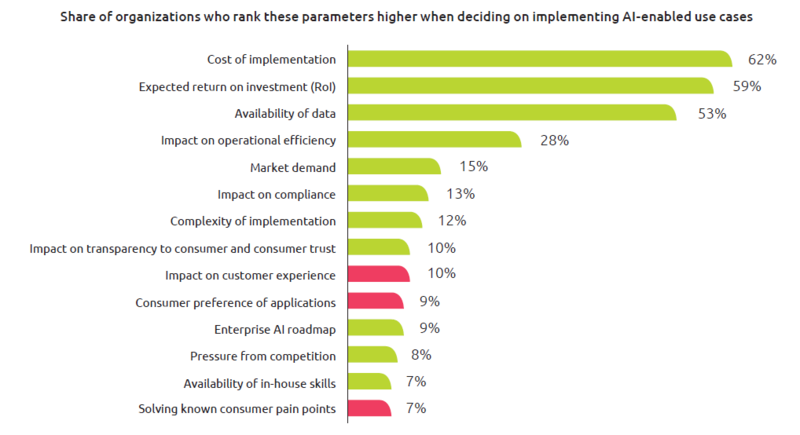 As Figure 3 shows, these two factors dominated decisions about AI-enabled use cases. However, more consumer-facing criteria – such as solving known consumer pain points – were much lower ranked. But some high-performing organizations are more focused on the consumer. As part of our full research analysis, which you can access here, we identified a group of high-performing organizations that we call the “Front Runners.” When they are deciding on AI use cases, these organizations focus on the impact a solution will have on the customer experience. As Figure 4 shows, these organizations are much more likely than the rest of the sample to focus on areas such as consumer trust and where market demand is heading. We also found that three out of four Front Runners make an AI-first approach a strategic imperative. These organizations treat AI as part of a core service and not as an afterthought. Also, over two-thirds (69%) of these high performers approach AI as a business topic rather than technical topic. An illustration of the strategic importance of AI can be seen in Google CEO Sundar Pichai’s assertion that AI is more important than fire or electricity. The firm also rebranded its research arm from Google Research to Google AI. Front Runners are asking the right questions. How can we make consumers true stakeholders in these interactions and understand their needs? How can we augment the customer experience in an AI world? Which interactions are best delivered by human rather than AI, and which by a mix of both?